Hello – I am back! Have you missed me? 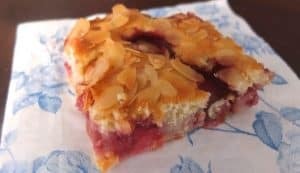 After two weeks of moving house I have returned with this simple cake recipe with frozen strawberries and almonds. My new house still looks like a car boot sale. It will be a few months before the new kitchen is fitted but thankfully the old owner left an eight hob range cooker behind. I made this cake just before we moved. My kitchen cupboards only contained ingredients that needed to be used up and I found this pack of frozen strawberries in the freezer. Of course I already posted a couple recipes with frozen strawberries such as the strawberry vodka recipe or my skinny strawberry vodka ice-cream, but now I was in need of some cake. If you want you can substitute the strawberries with any other frozen fruit such as raspberries or blackberries. It has a lovely moist texture which is contrasted nicely with the coarse texture of the roasted almonds. Whipp the cream until stiff. Fold in the sugar and vanilla sugar. Add the eggs and mix until dough is smooth. Now add the flour and baking powder by adding it spoon by spoon. Pour the dough into a greased backing tray (32cm x 36 xm). In a bowl mix the almonds and sugar. Place the strawberries carefully on top of the dough and cover with the almond sugar mixture. Place the cake into a preheated oven at 180° and back for 20-25 minutes until slightly browned. I brought the cake as a snack for our friends. We hired boats for the day and enjoyed a day in the sun at the Norfolk broads. Wrexham to be precise. If you want to read more about our trip have a look at the blog “Our next sunrise“. My friend Marylou writes about all her travel adventures including our trip to Wrexham.